Credit Pius Utomi Ekpei / AFP/Getty Images. 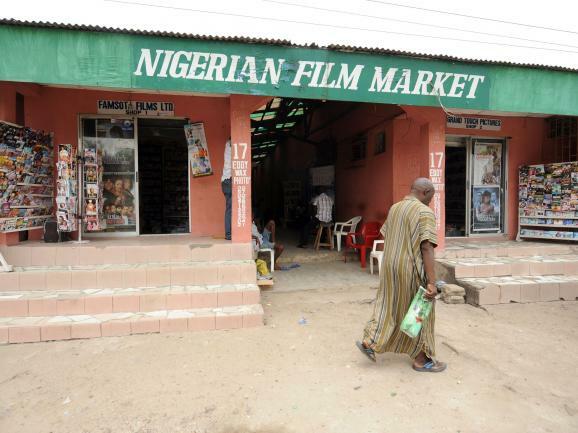 A typical Nigerian film market in Lagos. Today, Nollywood is the second largest film industry in the world. It falls behind only Bollywood in terms of production volume. While video is seen as the founding technology of Nollywood, Professor Akin Adesokan seeks to illuminate the relationship this industry has to its precursor—Nigeria’s celluloid films of the 70s and 80s. Adesokan takes a three part approach to the problem. He looks at industrial aspects of film making with respect to the project of nation-building. He outlines out a number of paradigmatic elements of Nigerian film that were established by celluloid directors, and which continue to be present in Nollywood. And, finally, he analyses Hostages, a 1996 film by prominent director Tade Ogidan. Hostages was created in the juncture between late-celluloid and early-Nollywood, and so sheds light in both directions. The economic circumstances of Hostages are also instructive—the film was very close to never being produced. It was originally conceived as television series, but Ogidan was unable attract sufficient investment. He ended up selling his own cars to help fund it, and though he was ultimately able to secure sponsorship from a new television station, the situation was always financially precarious. Numerous other attempted celluloid projects were not so fortunate. Although there was a great deal of resistance to the emergence of video as a filmic medium, the opportunities it afforded as far as allowing projects to actually see completion proved more compelling. Nollywood, with all its imperfections, is a happy accident, and represents one possible way of advancing [a Nigerian cinematic] discourse, which need not be simply nationalist. For, in the final account, whatever the nature and the context of the national discourse in Nigeria, it is not an end in itself, but a means to the realization of the principles of social justice, an open-to-the-world idea that Nollywood appears to be pursuing, making a home for itself in the imaginary of others. He contends that it is precisely Nollywood’s existence as a product, as opposed to as a governmental apparatus of nationalist culture, that allows for this possibility. Akin Adesokan is associate professor of Comparative Literature at Indiana University, Bloomington. His books include Roots in the Sky, a novel (2004), and Postcolonial Artists and Global Aesthetics (2011). He has also published essays and fictions in Research in African Literatures, Chimurenga, AGNI, Mail & The Guardian, Social Dynamics, Textual Practice, Black Camera and Screen.